View More In Fryers - Page 4. With the right equipment, deep-frying can be crisp and delicious instead of fat-logged and soggy. This Chefman Family Size Stainless Steel Deep Fryer includes several features that help you make tasty fried chicken, fish, shrimp and French fries. With an easy-to-use temperature control, timer, and a viewing window on the lid, this stainless steel deep fryer turns out perfectly cooked food every time. Other features include an immersion heating element, a charcoal air filter for crisp and clean frying every time and an included wire basket with an exterior handle to avoid spatters by lowering food into hot oil. The wire interior basket features small holes good for draining oil off while keeping small pieces in. 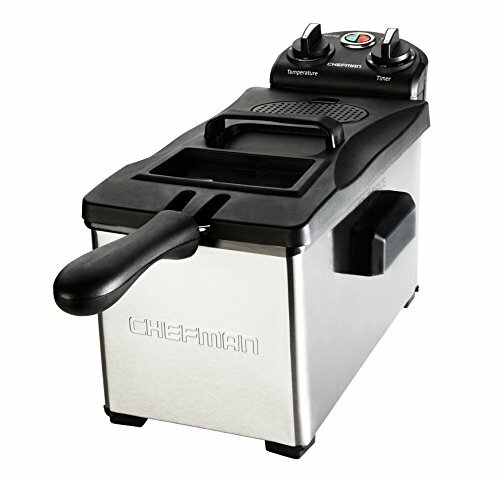 The Chefman Family Sized Stainless Steel Deep Fryer can be stored with the basket, handle and cord inside.